By Satoshi Wagahara and 029. Released in Japan by ASCII Mediaworks. Released in North America by Yen Press. Translated by Kevin Gifford. 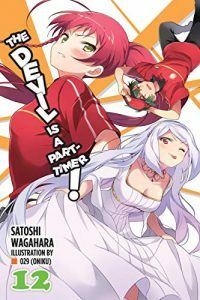 This is a stronger volume of Devil Is a Part-Timer! than the previous one, probably because the previous one got all the exposition out of its system in one gulp. Actually, the theme of this new volume could be avoiding exposition, as both Emilia and Maou do their absolute best to not talk to Laila and avoiding knowing why it is they’re the only ones who can save the world this time. In practice, this means this is a “downtime’ volume, though there is an exciting battle in a subway tunnel in the middle of the book. For the most part, though, Emi is still shattered by the last book, to the point where she runs away to a minor character’s home for college advice. Maou is just trying to get the new delivery program at MgRonald’s in gear. And Chiho should be pleased that Emi and Maou are finally acting closer, but this is offset by her realizing that she’s in a shonen love triangle where she’s the sweet girl who doesn’t get the guy but finds new confidence so that’s OK. Which does not sit well with her. That’s Laila on the cover, but I get the feeling it’s meant to be what Emi and Maou think she’s doing in this book, rather than her real personality. Laila is genuinely trying to save the world, but seems to be making a lot of incorrect assumptions as well, not least of which is “this is for a good cause so my daughter who I have been manipulating her entire life and the boy I helped before he was a demon king will totally be into it”. But sometimes world-saving is goddamn exhausting, and after getting kidnapped/rescued and learning some nasty truths about heaven and Enta Isla, neither Emi or Maou really wants to deal with it right now. Probably the best scene in the book (and the author knows it, as the other characters praise him for it as well) is Maou talking about assuming that the strongest person will always be there to protect and save. If you have something made of steel, does that mean it’s OK to beat the crap out of it? There’s also the romantic dynamics here. This series has been pretty good at keeping the romance there but on a low boil. Chiho has confessed to Maou (though he’s pretty much ignored that) and everyone can see how she feels. Suzuno is starting to realize that she may have feelings for Maou, though is very reluctant to admit it. And Emi, while not quite admitting that she’s in love with Maou yet, is willing to admit that she sometimes wants to be protected, and is OK if the person doing it is him. She even hugs him! (He does not hug her back. Maou still seems to be baffled by the concept of loving and being attracted to someone.) Unfortunately, both this and the main plot collide at the end, as due to a deal made between Maou and Laila, Emi is now refusing to leave his side, much to everyone’s horror. That said, she can’t keep running from her problems forever. I suspect the next volume will have more details on how we’re going to save the world next. But for now, enjoy Maou reminding folks that heroes and villains need downtime too.